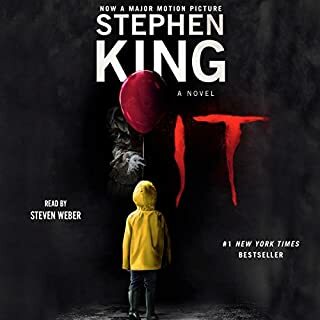 Stephen King's epic novel of childhood, horrors, memories, demons, evil, love, crime, salvation, desire and revenge is gripping from the start, and stays with you throughout the arc of the intertwining stories (the past of 1958 and the present of 1985). This audiobook is an enormous production as well -- at least in length, rivaling "Les Miserables" and "Gone with The Wind," both of which are 50+ hours long. At 44+ hours, "It" is a deep, immersive, frightening, enthralling and satisfying experience. Steven Weber is an excellent narrator (one small note: he muffs the pronunciation of certain French phrases), who is able to imbue individuality to all of the characters. He can also bring to life King's remarkable rendering of verbal grunts and shouts and sneers. Now a word about the production - quite often the ends of words are cut off. Here, King himself sometimes breaks off words in mid-sentence for effect, only to pick up the sense in the immediate next chapter, or one following it quickly. But the producers have also clipped the ends of Weber's spoken words with alarming frequency. This takes you temporarily out of the story. It's also quite annoying - careful editing should have been a must with an audiobook by such an important writer as King. Those quibbles aside, this is a terrific book (in both senses: horrifying and absolutely enthralling), and for the most part it's extremely well served by having it read by such a passionate reader as Steven Weber. Stephen King is a wonderful writer - a national treasure, really - and "It" is one of his most rewarding novels. It was a pleasure to discover a fine Trollope novel in audiobook form, outside of the wonderful Barsetshire and Palliser series, which are well represented as audios. In this novel, which explores forgiveness in many forms -- from personal grudges, to family shame, to broken hearts and the acceptance of a fallen women -- Trollope gives us another view of the clergy. 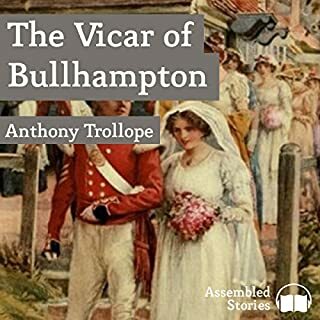 The vicar of Bullhampton himself is at the heart of the story, and he's a man who's quick to action, quick to fight, quick to be offended, quick to do good, but slow to forgive grievances. The other stories that surround him, from Mary Lowther's romantic guilt, to Carrie Brattle's tortured journey to a sort of redemption, are equally vivid. The narrator Peter Newcombe Joyce imbues the scenes with a vigorous emotion, and you can hear his voice break with real feeling as the characters reveal to each other their conflicted states of mind. I hope that Assembled Stories, which produced this volume, offers us other Trollope gems -- there are many more wonderful novels that we fans of Trollope would love to hear brought to life in this way. Especially if they're narrated with the full-hearted engagement that Peter Joyce has brought to The Vicar of Bullhampton. "Is the Game Worth the Gamble?" Framley Parsonage was Trollope's first big success, and you can see why. It's a perfect example of his great gifts of characterization, setting, humor and sympathy. 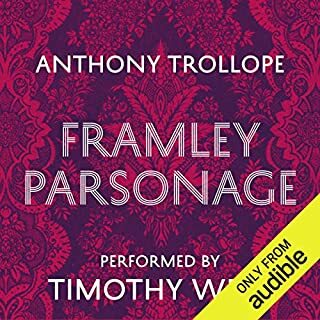 This audiobook, narrated by the brilliant British actor Timothy West, captures every facet of Trollope's narration, the depths of his characters and the marvelous humor and insights that Trollope always brings to his tales of flawed human beings. I can't recommend this enough. And if you'd like to truly treat yourself, Timothy West has narrated all of the Barsetshire and Palliser novels. What a gift Trollope (and Timothy West) gave us. Walter Hartright, a drawing teacher to two sisters, wants to marry Laura, though she is betrothed to another. But who is the mysterious woman in white he encounters? Wilkie Collins was a master of suspense, but his transfer to audiobook requires a cast of readers to faithfully reflect the11 different characters who tell the story. 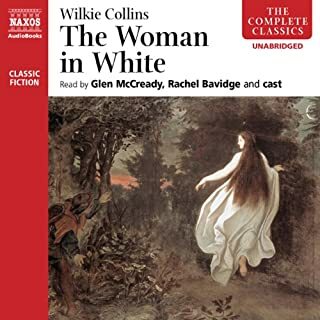 Naxos AudioBooks brings together a strong cast to bring alive the mystery and suspense of The Woman in White. This brilliant adaptation -- masterfully narrated by a series of gifted actors -- is compelling from first to last. I had read the novel some 15 years ago and while remembering the overall arc of the story, had forgotten some of the particulars. In any event, this version held me spellbound throughout its 27-plus hours. Not only is this one of the greatest thrillers ever written, it's also one of the best 19th-century works of English literature. This magnificent audio recording does justice to the plotting, pacing, characterization, suspense and storytelling mastery of Wilkie Collins. Now, if only Audible would release other Collins novels such as "No Name" in audio form! But just get your hands on this one -- this is a treasure. 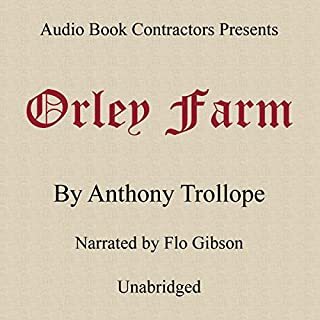 Would you listen to Orley Farm again? Why? This is a compelling story of great psychological insight. Flo Gibson's reading grows on you, and she carries you along through the turns of the tale. Lady Mason, who was conflicted by her actions, and comes to realize that ultimately the love for her son was -- well, I won't give it away. It's a powerful portrait of a complicated woman. Which character – as performed by Flo Gibson – was your favorite? A confession -- to say more would be revealing too much of the plot. I had at first thought Flo Gibson was rushing through the story, but her narration style grew on me, and I began to be under her sway before too long. 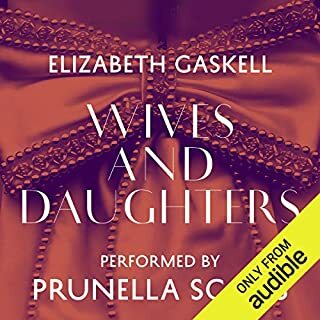 Prunella Scales brings great variety to the characters here, and her superb reading allows us to savor the profound depths of Elizabeth Gaskell's masterpiece. It's a great narrative of a great novel -- I didn't want it to end, and Ms. Scales is able to give us every character distinctly. A real triumph. I wish she read more Victorian novels!